Now a days we all have plenty of E-commerce sites that offer you good deal at awesome price. But there is unique concept too!. What if I will tell you : You Can Get New Stuff For An Old One ? You will say :Amazing!!! Isn't It ? Let's say you have habit of reading books like I have. Now after reading the book once obviously I will not read it again. Now it will reside in any corner of my room. Someone also need the book I have already read and I need the book someone else have. So using barter system on the Faida. All you need to do is post the advertisement on Faida.com and which book you are expecting in return. If someone with your requirement read it. You both can get your choice at your own convenience. You Do Not Believe me Check Click Here and check for yourself. Not only your old books but if you feel your smartphone has got old fashion or not satisfy with it. 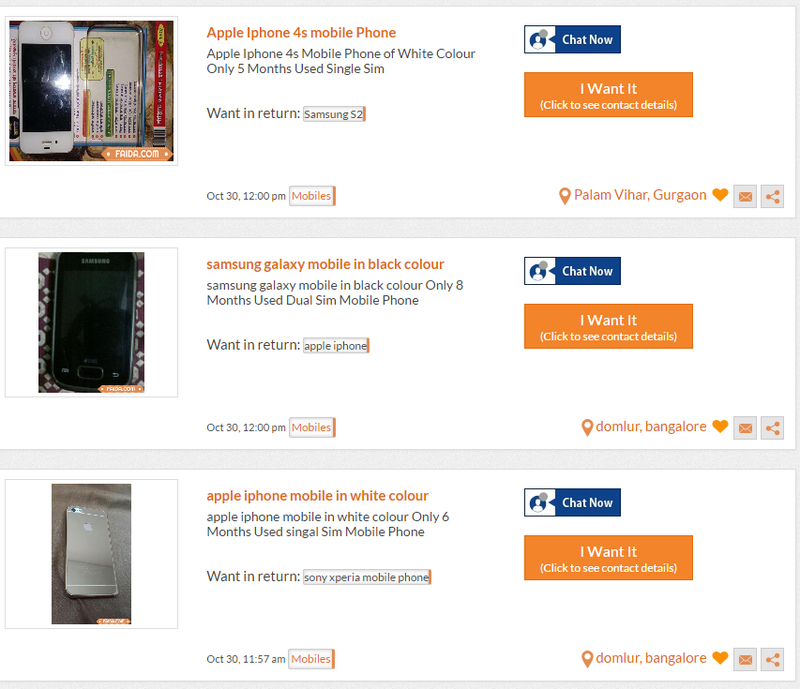 Post add on Faida and which smartphone you are expecting in return. Both exchanger parties need to just exchange a phone without paying a single buk to each other. Post it and get it. Just Check below Image. Not only Book, Novels and Smartphones but you can exchange other things in this barter system based site. Many times we get gift from loved once or friends or family or winning price from various competitions that is useless for us for many reasons. So this stuff will become part of our store room. Rather then let that thing get rust at our store room, we can exchange something useful at Faida. They also offer exchanges in Lot more category like household electronics that include your old TV, camera, Audio system, Desktop, Laptop, Kitchen Appliances and so on. Apart from that if you thing your cloths are just getting old fashions or you have couple of same cloths or jewelery you can exchange them too. So in shot you can exchange everything and anything here. Faida is not just all about exchanging thing fro things. They provide lot more convince for finding suitable stuff for you. You can filter your search based on location, photos, Condition provided by exchanger : Excellent, Not working, Good and so on, type of product : new or used. Not only this but also you can search exchanger based on your location. So you can exchange at your own ease and confront. What else do you need. All you have to do it get rid of your old stuff by just putting an add on Fiada and get new stuff for free that too at your own convenience. So this all about it. Thank you for reading.